But its existence just proves why we need powerful women in 'Star Wars'. 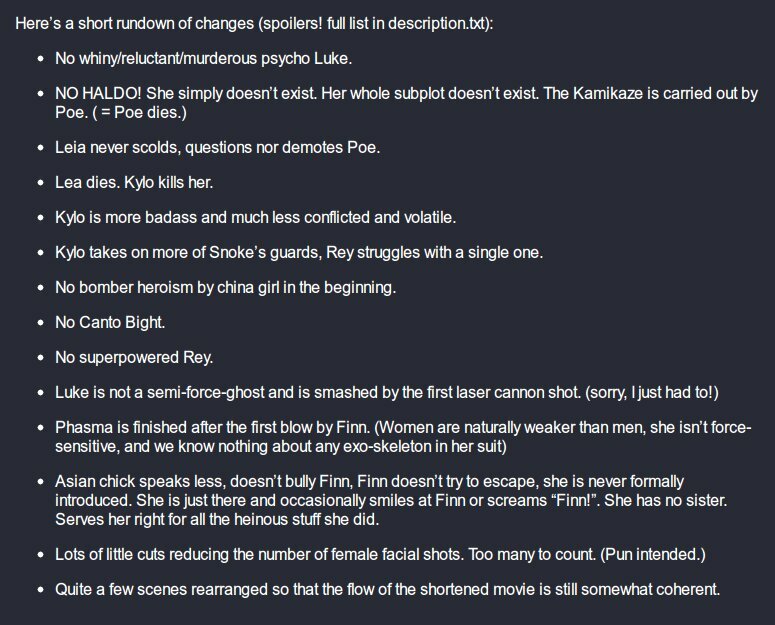 A Star Wars fan created edit of The Last Jedi that removes all of the women, and he’s getting predictably roasted online for creating what’s essentially just a low-quality chauvinist cut. The fan edit makes radical changes to one of the film's most epic action sequences. Most responses on Reddit assumed this whole thing might be a joke because it’s so exaggerated, as if a MRA parody wrote up a list of asinine perspectives. But sure enough, the many cuts promised are included in the file if you download it. Watch out for cooties, everyone. Let's be honest, the MRA neckbeard that made an edit of The Last Jedi without all the women was just trying to mirror his own womanless life. Considering the fact that the chauvinist cut of The Last Jedi is barely longer than an episode of Mad Men, it just stands to reason that we need powerful, assertive women in the Star Wars franchise to keep the stories compelling. The alternative is the emo führer Kylo Ren ruling the galaxy, and who would want that?